Haga clic aquí para registrarse ahora. Hi, AJ. you are my hope to get my dream. please, i want to be fluently in English and learn your skill for teaching. I love you AJ HOGE you're the best teacher, I study english on the institute because my native language is spanish but I can't learn very well and when I speak english I have to think the words that I'm going to tell, I'm in intermediate 3 and each month we always change of book, sometimes It's a little difficult but with your rules it's going to be great and better! :) Thanks! love you! you're so smart... I admire you! me gustaría hablar ingles pero se me dificulta que puedo hacer? 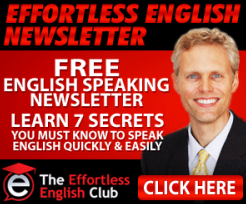 Si Effortless English estuviese en sú ciudad iría?